The Seoul Metropolitan Government announced that it has started commercial operation of eco-friendly full-size electric buses on the Mt. Namsan circular routes as of December 21. It is the first time in the world that battery electric buses have been put into commercial operations. SMG has worked on the project to develop full-sized electric buses with local technology over the last one and a half years, since it signed an agreement with Hyundai Heavy Industries and Hankuk Fiber for the development of electric buses in September 2009. Electric bus services will not only improve air conditions in the city but also lead the technology of large-sized electric vehicles in the global electric car market, the City said. The electric coaches serving on the Mt. 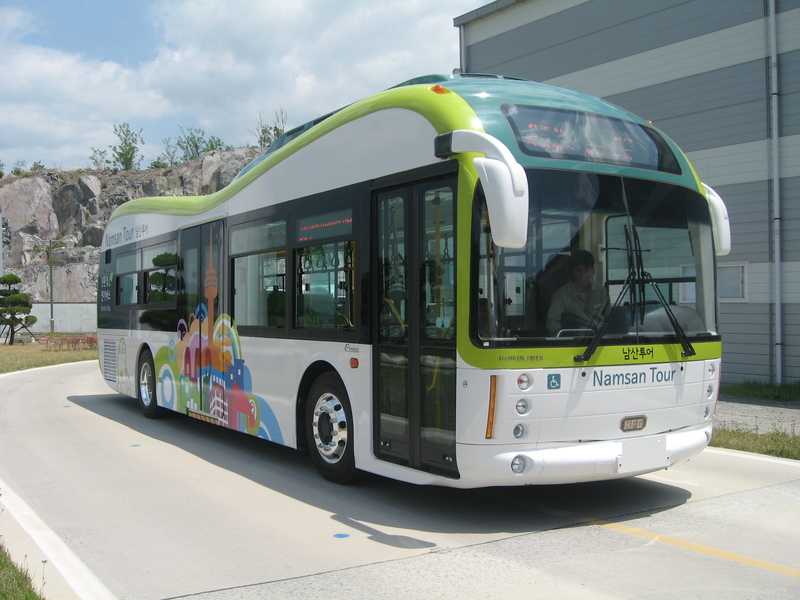 Namsan circular routes are 11.05 meters long and run up to 83km with a single charge. They can be fully charged in less than 30 minutes with a high-speed battery charger. The electric bus, with its maximum speed of 100 km/hr, has a low floor and a 322-horsepower engine. It adopts a high-capacity lithium-ion battery and an energy saving system that can collect and reuse energy generated from brakes when running downhill. Its body is made of a carbon composite material, not of iron plates, which considerably reduces the vehicle's weight while reinforcing durability. The electric buses are also equipped with automatic slant boards for wheelchair users. The bus is shaped like a peanut and decorated with designs symbolizing the Namsan Tower and landscapes of Mt. Namsan. SMG has replaced five buses on the Namsan circular routes with electric vehicles. It plans to gradually substitute all 14 buses with electric coaches to minimize any inconvenience of citizens that may be caused by the introduction of the new buses. It also plans to build two more battery chargers on Namsan by March 2011, increasing the number from two to four. SMG expects that the electric bus service has enabled Seoul City to move one step further toward a "Green-Car, Smart City." SMG has set a goal of putting a total of 120,000 electric vehicles in use in the city by 2020, which will account to 50 percent of all public transport vehicles, 10 percent of sedans and 1 percent of trucks and vans.